The appartment with its sunbathed balconies is situated at the southern approach to the village, 2 bedrooms sleep upto 5 persons. The village is in a mountainous nature area just 20 km from the beaches and just 15 km from Italy. The appartment with its sunbathed balconies is situated at the southern approach to the village, 2 bedrooms sleep upto 5 persons. 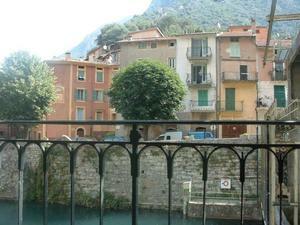 The village is in a mountainous nature area just 20 km from the beaches and just 15 km from Italy. There is a railway station at the village, with connection via Nice and Ventimiglia to Monaco and other international destinations. The village borders communal forests and the Natural Reserve Park Mercantour with the Vallée des Merveilles. The community encompasses the Maglia gorge, famous for canyoning, rafting and kayaking on the rapids of the river Roya.